Some say that "Beetle" Smith, as he was called by contemporaries, had the countenance of a Bulldog and needed that temperment to fill the assigned role as hatchet man for an affable Supreme Allied Commander, Dwight D. Eisenhower. He may have acquired that, along with a brusque manner and a salty vocubulary, in his first service as a Private in the Indiana National Guard. He entered the U.S. Army in 1917 as an Infantry Reserve Officer, and served in France with the 4th Division in World War I. 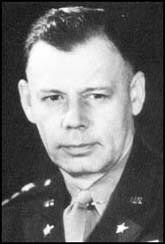 When General George C. Marshall became the Army's wartime Chief of Staff, he called in Major Smith, a protege, to be Assistant to the Secretary of the General Staff. He moved up to Secretary in September 1941 and in Febraury 1942 was named U.S. Secretary of the Combined Chiefs of Staff. Just before the invasion of North Africa, Marshall sent him to England to be Eisenhower's Chief of Staff. He filled that role until the German surrender, which he stage-managed for his boss. Ike subsequently called him "the greatest general manager of the war." Following the war, he served as U.S. Ambassador to the Soviet Union; Director of the Central Intelligence Agency (CIA); and Under Secretary of State. He died as a Full General at the age of 65 of a heart attack on August 9, 1961 at Walter Reed Army Hospital in Washington. He was subsequently buried in Section 7 of Arlington National Cemetery. 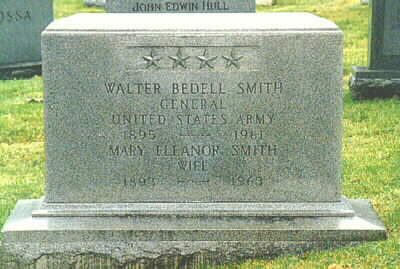 His wife, Mary Eleanor Smith (1893-1963), is buried with him. 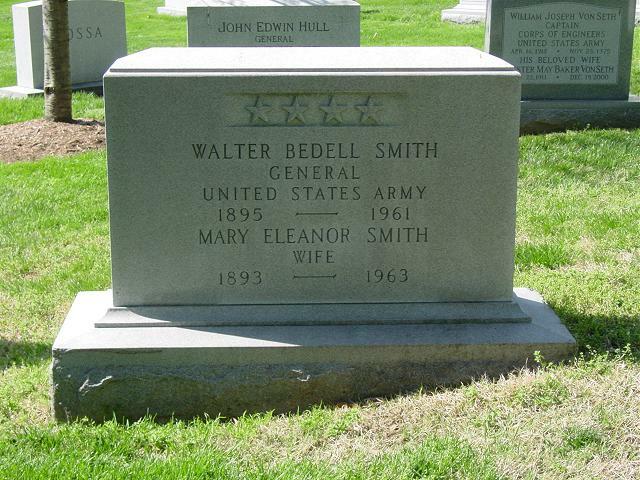 Walter Bedell ("Beetle") Smith, a career soldier, was born in Indianapolis, Indiana, and served as Second Lieutenant in the First World War. During World War II, he was General Dwight D. Eisenhower's Chief of Staff, reaching the rank of Lieutenant General by 1943. As General Eisenhower's, representative, he negotiated and signed the terms of surrender with Italy in 1943, and Germany in 1945. 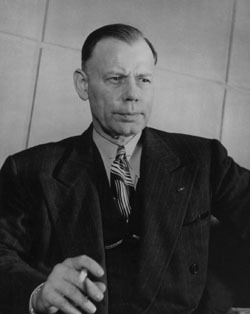 After the war, President Harry S. Truman appointed Smith as Ambassador to the Soviet Union. 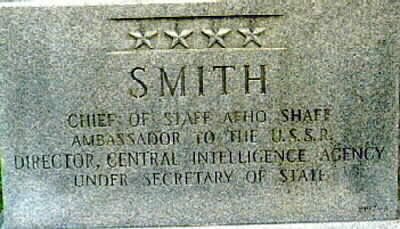 Smith later served as Director of the Central Intelligence Agency under President Truman from 1950 to 1953. During Smith's tour in Moscow, Soviet-backed governments were installed in Eastern Europe, and tensions mounted between the United States and the USSR.